After making the valance in the dining room I was inspired to create something for my bedroom. And once again I didn't want to spend a lot of money on something temporary. I found these sheer curtains at Lowe's for 10 bucks and used a tension rod to hang it in the window frame. 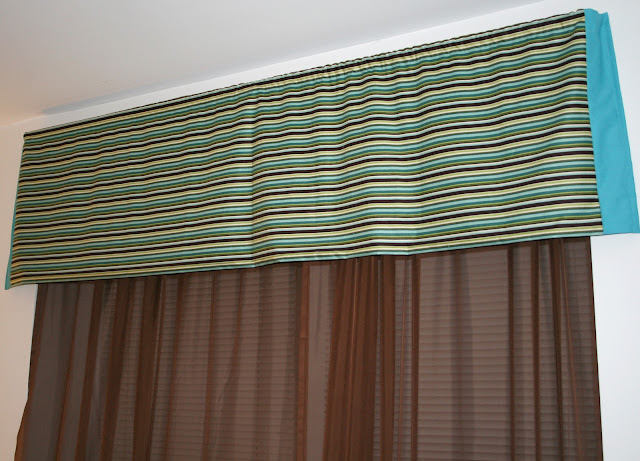 I pulled fabric from my stash that matched my quilt perfectly and doing the same technique as the dining room valance, I sewed the sides and added a casing at the top to use these inexpensive curtain rods. This time I had to use a little over 2 yards and as you can tell I didn't have quite enough of the striped fabric so I improvised and added a bit of blue on the ends. Try this technique next time you want to change the decor in your house without breaking the bank.